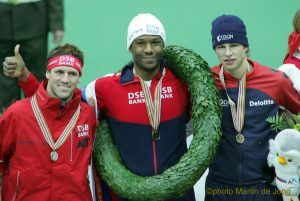 Shani Davis was born on Friday, August 13, 1982, in Chicago, Illinois. Raised by his mother on the city’s south side, he started roller-skating at local rinks at age two. By age four Shani was darting around the roller rink so fast that skate guards would chase him just to ask him to slow down. Seeming to become bored with roller-skating, a coach suggested that Shani switch to ice skating. Shortly thereafter, his mother started working for an attorney whose son happened to be involved in speed skating at an elite level and who suggested that Shani give speed skating a try. Shani joined the Evanston Speedskating Club at age six and within two months started competing locally. Though immediately thrilled by the sport’s speed, at competitions Shani was generally more interested in running around with his skating friends and playing video games than he was with competing. Nevertheless, by age 8 he was winning regional age-group competitions and began to hear about the Olympic ideal from his competitors and friends at the Northbrook Speedskating Club. Shani’s mother encouraged him to pursue his full potential, and in an effort to build his endurance woke him most mornings to run a mile on a track close to their home. As there were – and still are – no speed skating clubs in inner city Chicago, at age 10 Shani and his mother moved to the far north side of the city to be closer to the Evanston rink. Shani won five National Age Group Championships (1995, 1997, 1999, 2000, and 2003) and also won a North American Championship in 1999. 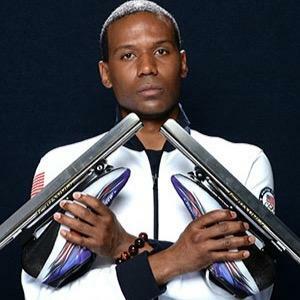 Though Shani became the first Black speed skater to earn a spot on the U.S. Olympic Team in 2002, Shani has never concentrated on making Black history. Shani began making skating history at age 17 when he became the first American skater to earn spots on both the short track and long track Junior World Team, accomplishing that feat three years in a row in 2000, 2001 and 2002. At 22, Shani won his third consecutive U.S. All-Around Championship and Regional Qualifier (long track events) and became the first U.S. skater to make all three World Teams in the same season (World Sprint, World All-Around and World Short Track), winning medals at all three events and ultimately winning the 2005 World Allround Championships in Moscow, Russia. At 23, Shani won Gold and Silver at the 2006 Olympics in Torino, Italy, and also repeated his World All-Around Title in Calgary. In the 2006-2007 season, Shani won world titles in the 1000 meter and 1500 meter events. The following season (2007-2008) Shani repeated his 1000m World Title. The 2008-2009 season saw Shani win his first World Sprint Title in Moscow, Russia, and his third 1500m World Title in Vancouver. In 2009-2010, at age 27, Shani broke two world records (1000m and 1500m), won Gold and Silver in the 2010 Olympic Winter Games — becoming the first man to repeat as Olympic 1000m Champion — and he won his third consecutive Overall World Cup Titles in the 1000 and 1500 meters. After winning his second Olympic Gold medal, Shani raised the bar even higher for speedskating excellence. In 2010-2011 he won the Overall World Cup 1500m for a fourth time and won the World Championship 1000m for a third time. He also lead his teammates to the USA’s first Team Pursuit World Championship Gold Medal. In 2011-2012, Shani won his record fifth Overall World Cup 1000m crown and passed the 50-win milestone on the World Cup circuit, becoming the United States’ winningest male speedskater. In 2012-13 he passed 10,000 points for his World Cup career, one of only three men to do so. In 2013-14 Shani won five World Cup races – 58 total, 2nd all-time – and skated to another 1000m/1500m ‘Davis Double’ at both U.S. Championships and U.S. Olympic Trials, winning both of his specialty races. Shani also claimed his seventh 1000m World Sprint Championships gold medal and garnered a record sixth Overall World Cup 1000m title. Earning the most World Cup points across all distances, Shani also won the Grand World Cup crown for the first time (officially) in his illustrious career. In 2014-15 Shani was crowned 1000m World Champion for the fourth time, marking his 10th individual World Championship title in his 10th year on the international long track circuit. In 2016-17 Shani became the all-time leader in World Cup points, surpassing the long-time mark of Canadian sprinter Jeremy Wotherspoon (13,009). Davis now stands at 13, 144 points and counting. Most recently, Shani was enshrined in the Smithsonian’s National Museum of African-American History and Culture on the National Mall, where he is honored as one of U.S. sports history’s greatest ‘Gamechangers’, alongside Muhammad Ali, Jackie Robinson and other luminaries. Approaching his 18th year of international competition, Shani has traveled the world competing in Canada, China, Finland, Germany, Hungary, Italy, Japan, Kazakhstan, Korea, Norway, Poland, Russia, Sweden, and The Netherlands. He is beloved and respected by speedskating fans everywhere he goes, and he even possesses a World Passport. He is also beloved by people at home, especially in his hometown of Chicago, Illinois, in Milwaukee, Wisconsin, and in Washington, DC, where he inspired the creation of Inner City Excellence (ICE), a skating-based youth development program rooted in Olympism that serves hundreds of children each year. Shani looks forward to continuing his pursuit of excellence far into the future, both on the ice and off.